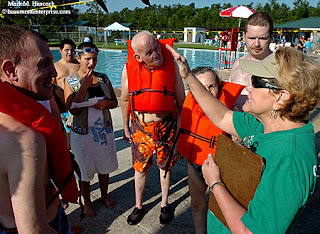 Jimmie Lea Simmons (right) organizes participants before the Golden Triangle 2007 Local Aquatics and Bocce Special Olympics competition at Conn Pool in Vidor on Saturday, Sept. 15, 2007. 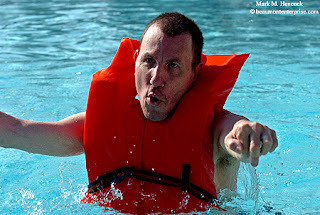 Charles Crumb competes during the Golden Triangle 2007 Local Aquatics and Bocce Special Olympics competition at Conn Pool in Vidor. 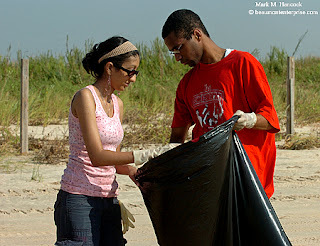 Shilpa Chandra (left) and Jelani Oville (right) with the American Medical Students Association at Lamar University collect trash during an Adopt-A-Beach cleanup event at McFaddin Beach near Sabine Pass on Saturday, Sept. 22, 2007. 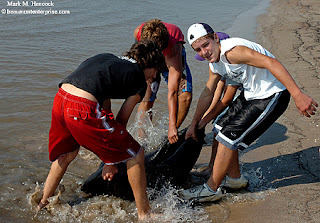 Tyler Montero, 15 (from left to right), Zechariah Turk, 16, Hunter Hanratty, 11, and Taylor Williams pull a truck inner tube ashore during an Adopt-A-Beach cleanup event at McFaddin Beach. The annual fall cleanup is sponsored by the Texas General Land Office and held at different locations along the Texas coast. 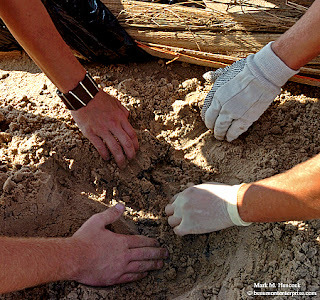 Volunteers dig in the sand for buried trash during an Adopt-A-Beach cleanup event at McFaddin Beach. 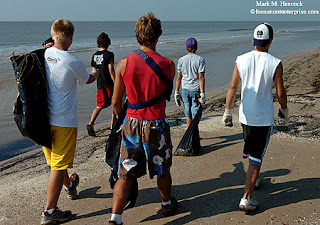 Daniel Curl, 16 (from left to right), Tyler Montero, 15, Zechariah Turk, 16, Hunter Hanratty, 11 and Taylor Williams look for debris during an Adopt-A-Beach cleanup event at McFaddin Beach. East Chambers' Justin Hallmark (No. 22, left) pulls down an onside kick as Hardin-Jefferson players move for the ball during a high school football game in Winnie on Friday, Sept. 21, 2007. Hallmark recovered two fumbles. Hardin-Jefferson's Stephen Smith (No. 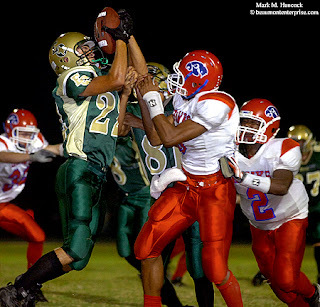 9, right) recovers a fumble during a high school football game against East Chambers in Winnie. Both teams entered the game undefeated. East Chambers took the game with a 49-10 victory. 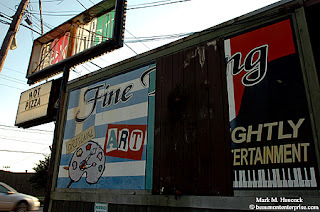 A car speeds past the weathered sign at Carlo's restaurant in Beaumont on Thursday, Sept. 20, 2007. Saturday was the restaurant, bar and art gallery's curtain call. 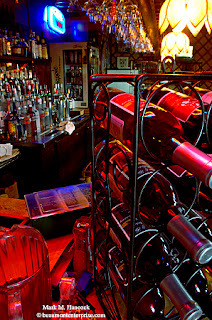 Fine wines and spirits await customers at the bar in Carlo's Italian-Greek restaurant. 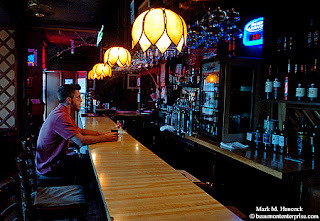 Schaeffer Bres of Beaumont sits alone at the bar in Carlo's restaurant. 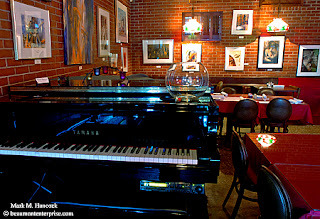 The player piano at Carlo's in Beaumont plays "Blue Skies" to an empty room at the restaurant. Only one other business-supported gallery remains for local artists. Although I don't have as many fond memories of Carlo's as other local residents, I acquired some. Primarily, Pete introduced the rest of the staff to me at Carlo's after I signed on with The Enterprise. On another occasion, Fayrouz and I celebrated a milestone in our lives here. Fay said they had the best calamari she's had in America. Many in the newsroom mourn the loss of Carlo's. It was considered "our place" by many "newsies." At one point, they had antique typewriters and cameras as wall decor in the bar area. The main dining room allowed local artists a place to display their works. Many local performers entertained diners from the tiny stage in an intimate setting. The story below mentions the remembrances of other folks. While overly-franchised restaurants continue to build in the area, the neighborhood restaurants and bars are threatened. Most importantly, local artists have lost a dear friend and supporter. Please read, "Carlo's closing after 40 years" by Jemimah Noonoo. 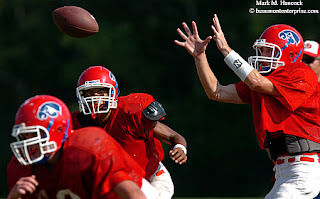 Hardin-Jefferson juniors Trey Burrell (center) and Marc Garrison (right) keep their eyes on a high snap during football practice at the school in Sour Lake on Wednesday, Sept. 19, 2007. The Hawks are 2-0 this season and face East Chambers (3-0) this Friday. 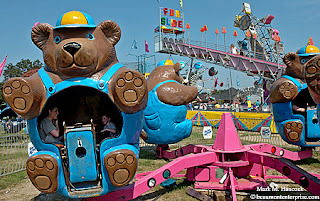 Erin Purifoy (left) and her son Garrett Purifoy, 5, (right) ride the Bear Affair on the midway during the annual Texas Pecan Festival in Groves on Saturday, Sept. 22, 2007. 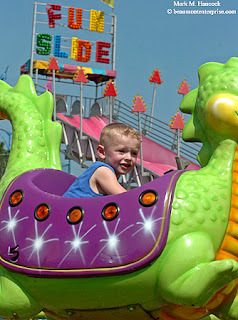 Aubrey Ueckert, 3, of Kountze rides the Happy Dragon on the midway during the annual Texas Pecan Festival. 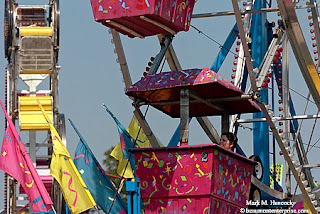 Ingrid Norris of Groves rides the Giant Wheel on the midway during the annual Texas Pecan Festival. Motiva plans to build an additional delayed coking unit (DCU) similar to this one at the Motiva Enterprises plant in Port Arthur on Friday, Sept. 21, 2007. 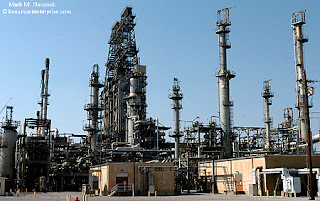 The planned expansion will make the Port Arthur plant the largest oil and gasoline production in the nation with a throughput of 600,000 barrels per day. Todd Monette, general manager of the Port Arthur plant, discusses the new $6 billion to $8 billion expansion at the Motiva Youth Training Academy in Port Arthur. More than 4,000 constructions jobs will be created by the expansion and more than 250 permanent jobs. 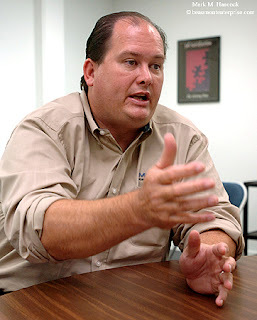 Please read, "Expansion will make PA refinery nation's largest" by Heather Nolan. 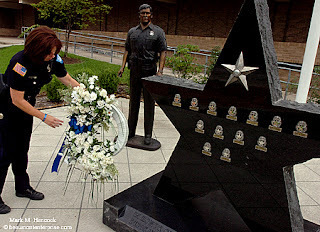 Officer Carmen Apple places a wreath in remembrance of officer Conrad Gernale at the Fallen Officer Memorial in front of the Beaumont Police Department in Beaumont on Thursday, Sept. 6, 2007. 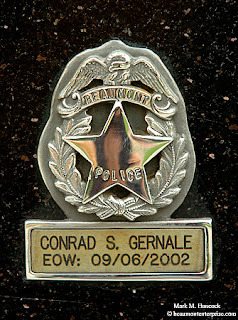 A badge commemorates officer Conrad Gernale on the Fallen Officer Memorial in front of the Beaumont Police Department in Beaumont. Officer Gernale was killed five years ago. Police Sgt. 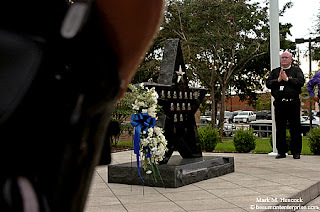 Yvette G. Borrero talks about her friendship with officer Conrad Gernale at a remembrance service at the Fallen Officer Memorial in Beaumont. Police chaplain The Rev. Richard Turner leads a remembrance for officer Conrad Gernale at the Fallen Officer Memorial. 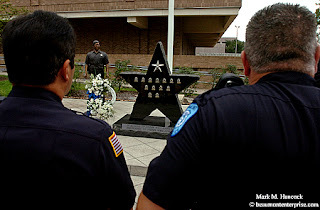 Officers Jose Ornelas (left) and Ken Karr (right) participate during a remembrance for officer Conrad Gernale at the Fallen Officer Memorial. Dallas Cowboys Cheerleaders Misty Duncan (from left to right) and Christina Parker talk with Bay Quebodeaux, 9, during an autograph session at David Self Ford, Lincoln, Mercury, Inc. in Orange on Tuesday, Sept. 4, 2007. 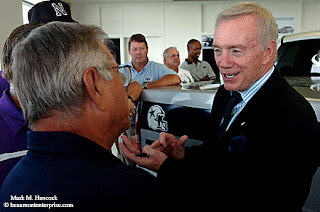 Dallas Cowboys owner Jerry Jones (right) talks to West Orange-Stark High School coach Dan Hooks (left) at David Self Ford, Lincoln, Mercury, Inc. in Orange. Jones was in town to promote his team, Ford and the Player of the Week program. Why would the Cowboys visit Orange, Texas? Cowboys' new head coach Wade Phillips is from Orange, Texas. Who else might be from around here? Former Cowboys head coach Jimmy Johnson is from Port Arthur. Phillips is the third head coach from Texas. Y'all might have heard of the other one. His name is Tom Landry. Landry and Johnson each won two Super Bowls for the Cowboys. The Cowboys have won five Super Bowls. So, four of five wins are from Texas coaches and two of five are already from Southeast Texas. I think Jones may be expecting at least another pair from the son of Houston Oilers' former coach "Bum" Phillips. In regular season play this year, the Cowboys are 2-0. However, I still haven't watched an NFL game (or bought Canon products) since the NFL vestvertising program. Yes, it's small, and PJs can put tape over the logo, but it's still silly. 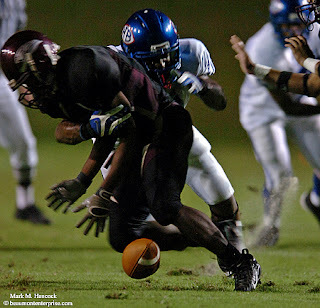 Central High School's Charles Thomas (No. 9) fumbles the ball as he's hit by West Brook's Blake Chavis (No. 10, right) during game two of the Beaumont Bowl in Cardinal Stadium at Lamar University in Beaumont on Friday, Sept. 7, 2007. Central eventually recovered the ball to keep possession. To make the show play better, CLICK HERE to view only this post. Hurricane Humberto developed from a tropical depression into a strong Category 1 hurricane in 18 hours. Most Southeast Texas residents went to bed expecting a bad storm and some morning flooding. Instead, Hurricane Humberto hit hard and fast. For residents of High Island and surrounding communities it hit with unpresidented fury. Luckily, there was only one hurricane-related fatality. 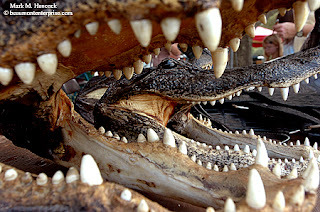 Visitors examine stuffed gator heads by Robert W. Snowden during the annual Texas Gatorfest at Fort Anahuac Park in Anahuac on Saturday, Sept. 15, 2007. 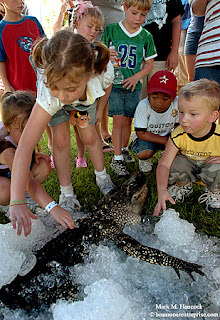 Children examine an alligator during the annual Texas Gatorfest at Fort Anahuac Park. The festival celebrates the Texas alligator hunting season. Gator season lasts only 20 days in 22 Texas counties. 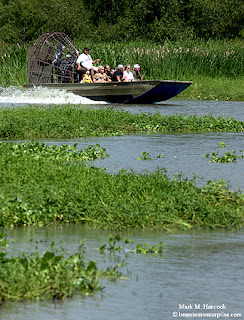 Visitors take a ride in an airboat during the annual Texas Gatorfest at Fort Anahuac Park. 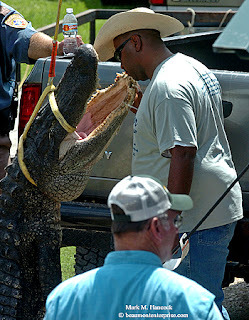 The festival offers cash prizes to hunters for the largest and most alligators captured during the event. Darrin Jackson, a GatorFest official, checks out the mouth of a large gator during the annual Texas Gatorfest at Fort Anahuac Park. Hunting gators requires a special permit. Farmers faced a tough year after extensive rains during planting season and now have been hit by Hurricane Humberto. Rice crops in particular are expected to suffer the most from the recent hurricane. Please read, "Heavy rains, hurricane put rice crop in jeopardy" by Emily Guevara. Between spotty DSL and a heavy workload, I had to make some decisions. Instead of sticking to schedule, I decided to post all the slideshows I have in backlog. This way I can work on new projects. Expect to see a Hurricane Humberto slideshow and video soon. Although damage wasn't as widespread as with Hurricane Rita, Humberto hit hard in the areas it chose. To those folks, it was worse than Rita. The biggest problem was the speed Humberto formed. It went from zero to almost Category 2 in 18 hours. There wasn't enough time (or warning) to evacuate or relocate folks with medical conditions. Most folks went to sleep expecting a tropical storm and woke up to a strong Cat. 1 hurricane. When the power cut off for most residents, it cut off breathing machines and other lifelines. Luckily most people had back-up plans. There was only one known fatality. One is too many, but it could've been much worse considering the circumstances. Luckily it has cooled down, so we're hoping the Gulf stays calm. However, there's currently four low pressure areas of concern for all of us. Therefore, it's wise for local folks to quickly restock the hurricane cabinet and be ready for another one. I suppose we could take a few more Humbertos rather than anything like Rita. Members of the Edward Lea Sons of Union Veterans of the Civil War reenactment group participate in a ceremony honoring Union soldiers lost at the Sabine Pass Battleground State Park and Historical Site in Sabine Pass on Saturday, Sept. 8, 2007. It was the first event to take place at the park since Hurricane Rita destroyed it almost two years ago. On Sept. 8, 1863, 48 men repelled an attack by four warships and 1,200 men of the Union Army and Navy. No Texas defenders were lost in the battle. 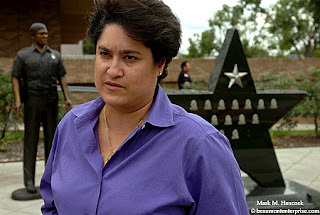 Please read, "Union soldier monument marks battle along with Rita recovery" by Rose Ybarra. The Morning Out program allows Alzheimers caregivers a break from their daily difficulties by providing safe, social interaction for the Alzheimers patient. Caregivers drop off their family member with Alzheimers and get work done or relax for a few hours while the family member is in an encouraging social setting. The program recently celebrated its 3rd anniversary and will expand from once per week to twice per week in September. Activities include a review of current events, music, exercise, games, mission projects, special guests, and weekly devotionals. Volunteers assist participants in the program with activities and provide lunch. Please read, "Morning Out Club creates a social outlet..." by Rose Ybarra. 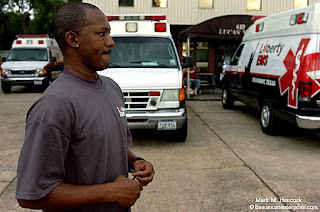 EMT Jeff Simpson said he's concerned about his family after Liberty EMS didn't meet payroll and closed its doors at the end of the day in Beaumont on Friday, Sept. 7, 2007. The closure of the Beaumont office left about 40 people without jobs or pay for the last two weeks. Please read "Beaumont ambulance office pulls the plug" by Beth Gallaspy. 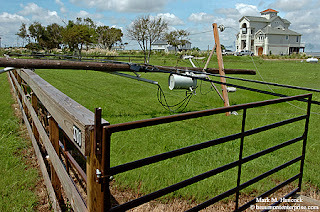 A power line balances atop a fence on the southern end of Pleasure Island in Port Arthur on Thursday, Sept. 13, 2007. Hurricane Humberto made landfall near Sea Rim State Park early this morning. We're OK. Fayrouz got a four-day weekend a la Humberto. Consequently, she's blogging this weekend while I'm covering some clean-up and football (nothing stops Texas football). I don't want to downplay Humberto until the full damage assessment is done. However, I'll say it was a "Girly Boy" compared to Hurricane Rita. So, we're not doing dawn-to-dark reporting like we did last time. Local folks are encouraged to check out today's paper. 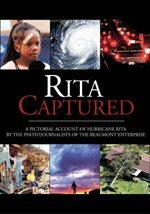 It has a special section of photos and stories about Hurricane Humberto. I'll start building a slideshow this weekend for y'all and post it next week. 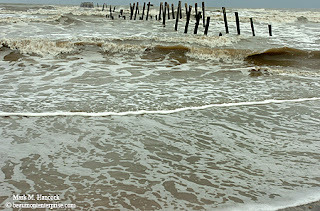 Waves are stronger than normal on the Gulf Coast near High Island on the Bolivar Peninsula on Wednesday, Sept. 12, 2007. Tropical Storm Humberto is expected to make landfall overnight according to the National Hurricane Center. Tropical Storm Humberto is expected to possibly make hurricane status before making landfall this morning somewhere between High Island and Sabine Pass. It is a slow-moving storm and is expected to bring between five to 15 inches of rain as it passes through the area. Area residents are urged to avoid non-essential travel. Avoid underpasses and don't attempt to drive through water unless the road is clearly visible. The Beaumont Enterprise will present up-to-the-minute reports on local conditions throughout Thursday. Please check the Web site as we'll be transmitting from the field and updating frequently. The photo staff will begin reporting shortly after sunrise (or light allows). The photo stream should begin about 7 a.m. Central Time. The newspaper has developed Texas Hurricane News. It's a comprehensive site with checklists, evacuation maps, hurricane tracking maps, post-storm advice and other features. It contains useful advice for anyone living along the Gulf or East coasts. The NOAA color-enhanced Gulf IR images are updated each 15 minutes. Lamar University, LIT and their affiliates are closed Thursday. Many school districts and businesses throughout Southeast Texas will be closed on Thursday due to anticipated flooding. Other school districts plan late openings or other delays. The newspaper is tracking school closings and road conditions on this page. Otherwise, please check your local school district Web sites for more information. Post script: Humberto amplified from a tropical storm into a strong Cat. 1 Hurricane and hit five miles from where this image was made about 12 hours after the image was made. Odom Academy student Lauren Jackson poses for a portrait in The Beaumont Enterprise studio in Beaumont on Wednesday, Aug. 8, 2007. Jackson's individuality is expressed with her red accessories including a necklace, belt, bracelet and socks. All BISD middle school students must abide by a strict dress code. Odom Academy student Lauren Jackson shows her code-breaking accessories, which include a red necklace and bracelet. Marshall Middle School student Daniel Seastrunk's individuality is expressed with his shoes and matching undershirt. 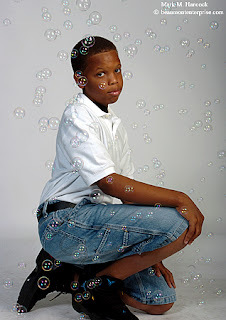 Marshall Middle School student Daniel Seastrunk poses for a portrait with his shoes and matching undershirt. 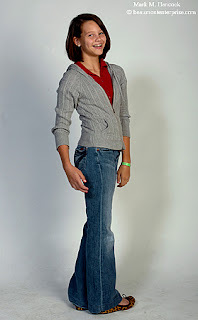 Marshall Middle School student Catherine Swantner poses for a portrait with her signature shoes and jacket. Marshall Middle School student Catherine Swantner's individuality is expressed with her shoe and jacket selections. Please read "Beaumont students find 'loopholes' in dress codes..." by Jamie Reid. 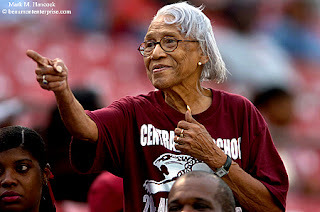 Verna J. Payne of Beaumont points out her grandson, Quenton Woods, as the Central High School band moves into the stands in Cardinal Stadium at Lamar University in Beaumont on Friday, Sept. 7, 2007. Central squared off against West Brook for game two of the Beaumont Bowl. American Indians from across the country gathered in their finest regalia at the Alabama-Coushatta reservation on the first weekend in June to dance, sing, drum and reunite. The Alabama-Coushatta Tribe 39th Annual Pow Wow invited guests to reconnect to the proud heritage of this land and its people. 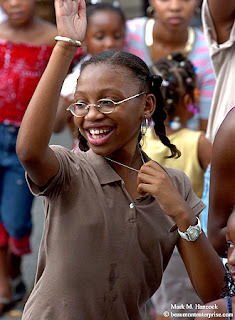 Taylor Smith, 10, of Beaumont sings praise during the Back to School Supply Giveaway at the Pride of Beaumont Masonic Lodge in Beaumont on Saturday, Aug. 25, 2007. 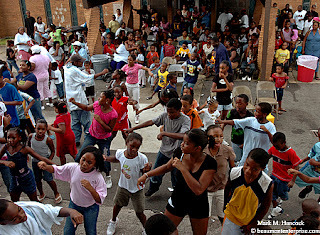 Community members dance to a DJ's songs during the Back to School Supply Giveaway at the Pride of Beaumont Masonic Lodge. 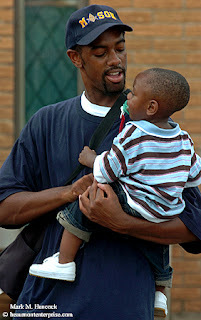 Lyndon Gilford dances with his son Kobe Gilford, 1, during the Back to School Supply Giveaway at the Pride of Beaumont Masonic Lodge. 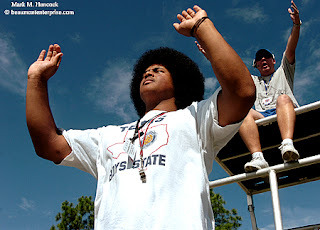 West Brook High School drum major Cameron Jean (left) and band director Fred Turner (right) conduct during marching practice at the school in Beaumont on Tuesday, Aug. 28, 2007. 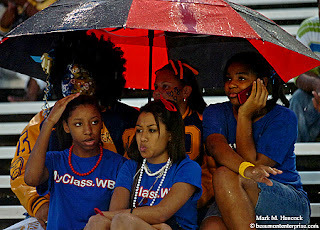 Football fans for both teams (clockwise from top, left) Kayla Bridges, Paige Nealy, Kiera Bridges, Teria Lavergne and Chelsea Carrier huddle under an umbrella before a high school football game in Cardinal Stadium at Lamar University in Beaumont on Friday, Aug. 31, 2007. Ozen's Cory Lewis (No. 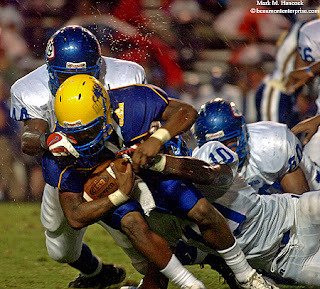 11) gets facemasked by West Brook's Adorian Underwood (No. 44, left) during a high school football game in Cardinal Stadium. Beaumont has two 4A and one 5A team. West Brook's Jordan Garrett (No. 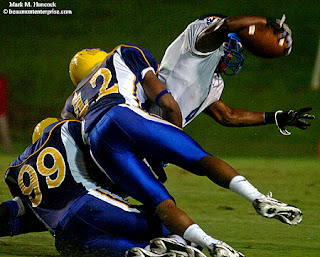 4, top) leaps for extra yards while Ozen's Jimmy Johnson (No. 99, left) and Justin Isadore (No. 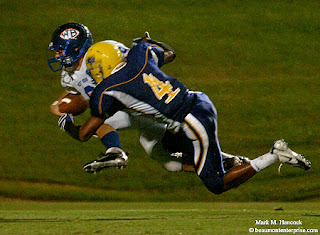 42, center) hold on during a Beaumont Bowl football game in Cardinal Stadium. Each team plays against the others before regular season to improve skills and garner bragging rights for the year by winning the annual Beaumont Bowl. West Brook's David Falgout (No. 9, left) leaps for a touchdown while Ozen's Desmond Wilcox (No. 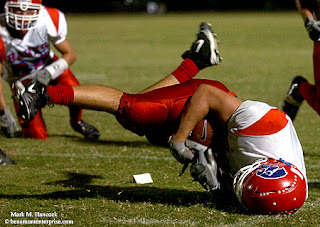 4, right) tries to prevent the score during a high school football game in Cardinal Stadium. West Brook won 26-6 and faces Central today. This project could be implemented at every newspaper (or initiated by a concerned bank). It's a helpful way to involve readers in communities and help communities become better places. It also benefits front-line news professionals as well as the publications themselves. Currently, news professionals include known donation information in stories. However, the subjects of breaking news situations almost never have an account for donations and/or rarely know to get one. If this project is implemented at several newspapers, communities could immediately help their neighbors. While this pitch is designed for newspaper management, it could also be a grassroots project from news professionals upward. Increase circulation, advertising revenue, employee morale and retention as well as access to news subjects while helping distressed people within a newspaper's readership area and creating goodwill with our readership. Create one general and multiple individual relief fund accounts for subjects of local news stories. Reporters, PJs and management could have the ability to assess distress levels of story subjects and easily create accounts for the subjects. Print and online readers as well as advertisers and other concerned organizations would be able to make donations directly to the subjects through the newspaper and its banking partner. Donors could also contribute to a community's general need fund. The general fund would supply seed money for new accounts while individual accounts would get direct funding from donors. Although it would be best to set up these accounts as a not-for-profit foundation affiliated with the newspaper (to allow donations to be tax deductible), it would be fair in the interim to simply state donations aren't tax deductible. This project can be completed without any cost to the newspaper. Reporters and PJs currently complete this work without a way to benefit the subjects of our reports. To make the project more viable, it could cost some administrative time to establish payment and accounting methods. It could also cost some additional time and expense to establish an affiliated non-profit foundation. Ideally, the newspaper would donate some seed money to the project or offer some additional matching funds as the project progresses and fulfills the desired goals of increasing readership, circulation, ad revenue and employee recruitment and retention. Obviously, this could be tax deductible in many circumstances. Initially, a partnership must be established with a bank of management's choosing. This could most likely be a current advertiser. The partner bank should be encouraged to add this distinction to their advertising plan and help establish the initial seed money for the project. It's critical that the partner bank charges no administration fees to these accounts and understands why. The bank would create a general fund and a simple system for newspaper front-line personnel and/or editors to establish new accounts for subjects named in news stories (individuals or organizations). Individual accounts would be seeded from the general account and then remain open for a designated amount of time. Upon creation of an account, the bank would send the recipient a debit card to access the account. With the card and/or proper identification, the recipient would be able to immediately draw from the account. All taxes are the responsibility of the recipient. Reporters and PJs with stories of legitimate-need about people within their readership fill out an online form prior to publication for an account reference. The account reference is listed with the published story and online. Donors can either deposit directly into the account via traditional means or through online transfer through a secure porthole of a newspaper's Web site. As stated, reporters, PJs, editors and management with stories of legitimate-need about people within our readership create accounts for story subjects. * Immediate potential loss of life or property. * Total loss of life or property. * Uninsured severe need of medical supplies or attention. * Uninsured loss of property (home or business). Periodic updates on various subjects (particularly near the end of the donation period), would reward readers for their compassion. People prefer to know about the needs of their neighbors more than the needs of someone they don't know. As such, people with the ability to contribute to help their neighbors would like to do so and need a source to clarify legitimate need. This project would fill this need. Consequently, it's anticipated more people will read these stories to know how to help their neighbors or get help for themselves in times of need. Simply stated, it's a community-wide, need-based insurance policy. As readership grows, so shall circulation. As an additional motivation for significant donations, a one-month subscription could be granted to donors who identify themselves. Since these particular donors have sufficient income to donate, it's understandable these same donors have sufficient income to purchase a subscription but haven't completely familiarized themselves with the newspaper. Online donors could be rewarded with archive access if the newspaper has a paid archive system. As circulation increases, so can ad revenue from both advertiser motivation to contact readers as well as proportionally increased ad rates. As advertisers are motivated to join the project, they'll have created a vested interest in the project and the viability of the newspaper itself. Advertisers receive an additional incentive by having their name listed periodically on a "thanks to our partners" house ad. Furthermore, they're encouraged to include their donor partner status on future paid display ads within the newspaper. Hopefully, this reminds them to place regular ads. Advertisers get additional clientele from the house ad and realize the usefulness of placing display advertisements in the newspaper. If the donor business stops donating to the fund, its clientele may question the stoppage. Since there are no administration fees and each recipient is confirmed by reporters, the business would be urged by their regular clients to continue to be a part of the program. Although a newspaper's primary function is to make a profit, its special status in a community is to inform the public. This information often surrounds subjects in dire need. When a reporter or PJ approaches these subjects with nothing but a request to collect personal information, the subjects have less incentive to cooperate and may become hostile toward news gatherers. This program allows the front-line personnel to gain access, trust and information while helping the community as a whole. News gatherers could, over time, be welcomed and actually invited to collect news about the people most in need of help. This could additionally elevate the status of the newspaper in the eyes of our readers. Great reporters are caring, passionate professionals. Although motivated by adequate income, they're often equally motivated by performing a greater good for readers. This project is exactly the motivation needed to help recruit, retain and motivate great reporters. With this tool to help alleviate some of the misery news professionals encounter, they could be motivated to help others through their work. This doesn't mean the professionals are doing less without this project, but it's a significant motivator to recruit and keep quality newsroom personnel. At the end of each day, our readers, news professionals, management and advertising partners should feel they've been a positive influence to the community. 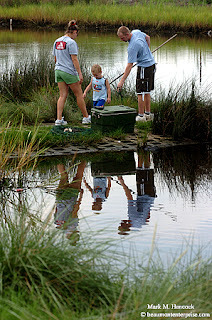 Tami Allen (from left to right), her son Jacan, 3, and husband David Allen of Orangefield fish in the marsh off Texas Hwy. 87 near Bridge City on Tuesday, Sept. 4, 2007. 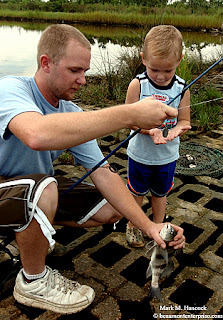 Jacan Allen, 3, requests to hold a drum caught by his father David Allen of Orangefield by the marsh off Texas Hwy. 87 near Bridge City.